Capturing night lights is one of my favorite subjects to photograph. Sometimes the temperature is cool (especially in Flagstaff), but the photos don’t disappoint. Last fall, I met up with my Northern Arizona University student photo club to photograph night lights. We stuck to a two block range on Aspen beginning at San Francisco and ending up in front of the Orpheum Theatre at Beaver Street. We bundled up in our winter jackets and kept warm except for our cold hands holding the metal tripod legs. When we approached the Orpheum some young men were in front of the building hanging out. Adding people to the photo can add a sense of scale to the image, so I took the shot. Then reviewed it on my LCD panel and decided it was boring. So, I looked around for something better. 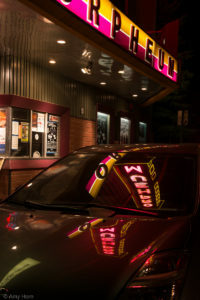 There was a car parked in front of the Orpheum limiting my view from the front side. I knew I had to work the subject, so I walked around the car anyway. Then, I saw a great refection in the windshield of the car. 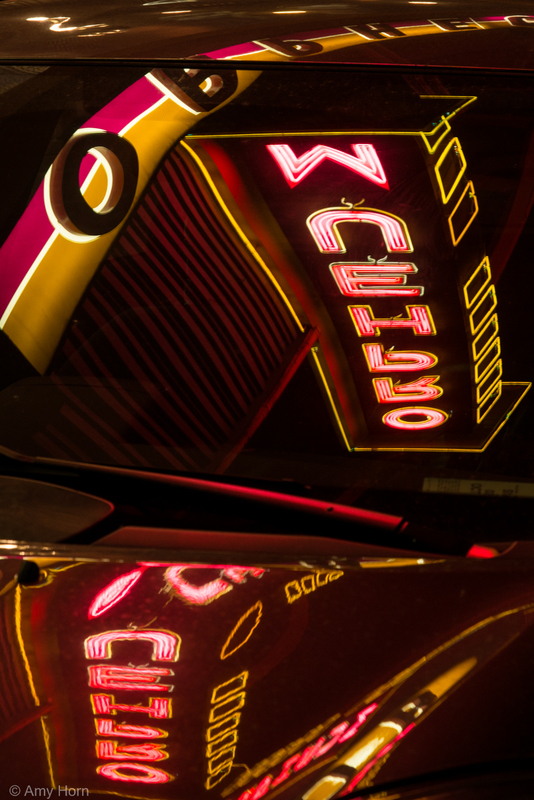 I took a shot of the bright sign and the reflection in the car window. The photo still wasn’t working for me so like I often do, I thought to myself, “What interests me here?” It was the reflection. 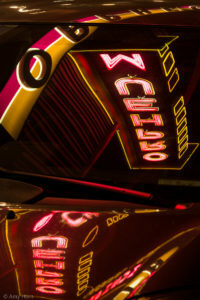 I recomposed to include the reflection of the Orpheum sign only. This image works. My final adjustments in post processing included a little spot removal of bugs on the windshield. Although my students weren’t sure what I captured in my frame, once I shared the image with them they understood. It was another successful evening capturing the night lights in Flagstaff. This entry was posted in Inspiration, night photography, Reflections, Technique and tagged entertainment, reflections, street photography on April 13, 2014 by admin.